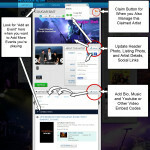 This is how to claim your artist listing and start getting gigs for FREE. When creating your page check off the box that says “Claim”. From an already existing Artist Page, click “Claim this Page”.